Do you believe in the magic of Falmouth? I had heard of this so-called “magic” countless times, both from runners and spectators that had been a part of the Falmouth Road Race. It had been described to me in many different ways, but nearly everyone agreed – the Falmouth Road Race has a spirit all its own, one that makes it one of the best, most enjoyable road races in the country. As I reflect on last Sunday’s Falmouth Road Race – a truly inspiring accomplishment for the Joe Andruzzi Foundation and an event where I joined Team JAF’s field of runners in running the race and helping to raise more than $136,000 in support of cancer patients and their families – I can say yes, I certainly do believe in the magic of Falmouth. 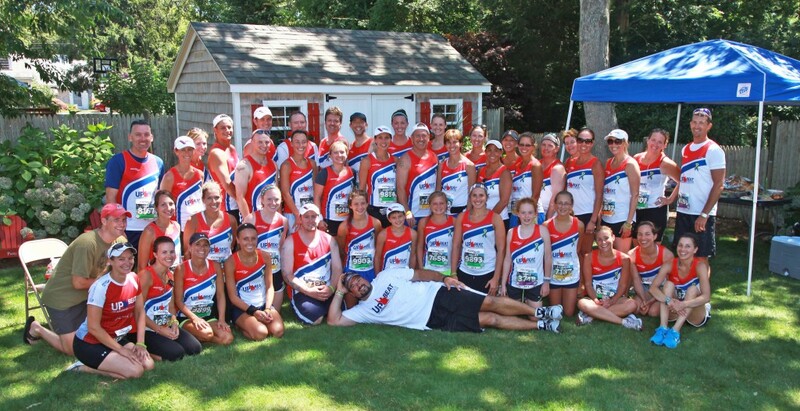 This year, we set great expectations for our Falmouth Road Race team, securing 63 runner bibs, a fun tribute to Joe’s jersey number from his days in the NFL. We knew this was an ambitious goal, and we immediately began recruiting runners – leveraging social media, relationships with business partners, our personal networks and word of mouth to find those ready to lace up on behalf of the Foundation. In no time at all – thanks in part to the assistance of our friends at Boston-based brand agency Digitas – Team JAF’s 63 runners were confirmed and they soon hit the ground running, training and fundraising for the 7.1 mile race on August 11. To this amazing group of runners who have done so much for the Foundation: we thank you. You are all Rock Stars and we couldn’t be more grateful for the commitment you’ve made in support of the Foundation. Take pride in all that you’ve done – from the early morning training sessions to the extraordinary fundraising outreach you’ve completed. Know that this hard work will provide much-needed relief for our patients and their families throughout the year. As an amateur runner, I never thought that running could be a sport I would truly enjoy. After witnessing firsthand the dedication you’ve brought both to the sport and the Foundation, I think I’m starting to come around. Team JAF runners, you have inspired me! While we are proud of the efforts of all Team JAF runners, we would like to recognize a select few for their outstanding performances, both in impressive race times and personal fundraising achievements. Congratulations to our Top 5 Race Finishers: 1. James Brosnan (49:22) 2. Marit Pywell (51:48) 3. Liz Dorrance (54:06) 4. Catherine Beer (55:06) 5. Dan McCallum (55:31). Another big congratulations and thank you goes out to our Top 5 Race Fundraisers, who fundraised well beyond the minimum commitment of $1,250: 1. Peter Riddle ($6,680) 2. Jim Ricciardi ($4,265) 3. Tracey Dickey ($4,255) 4. Shannon O’Brien ($3,381) 5. Dan McCallum ($3,250). There’s still time to support our runners! Our fundraising window remains open until September 11, so please support Team JAF’s runners today! Once all of our runners had crossed the finish line, we returned to the home of Patty and Joe Kelley, our gracious after party hosts. Many who have been to a Falmouth Road Race know that one of the most enjoyable aspects of Falmouth are the wonderful post race celebrations. The Kelley’s certainly did not disappoint; Patty and Joe, we thank you for your hospitality. And finally, we would like to thank our principal Falmouth Road Race Sponsor, East Commerce Solutions, Inc. for their continued support of the Foundation. We couldn’t do this without you. To everyone else who has played a role in Team JAF’s success: the families of runners, the donors, the training partners, and many, many more, we thank you as well. To Team JAF runners: continue to wear that Joe Andruzzi Foundation singlet with pride, and we look forward to bringing the “magic” back to Falmouth with you next year. Don’t forget to take a look at the photo album from Sunday!